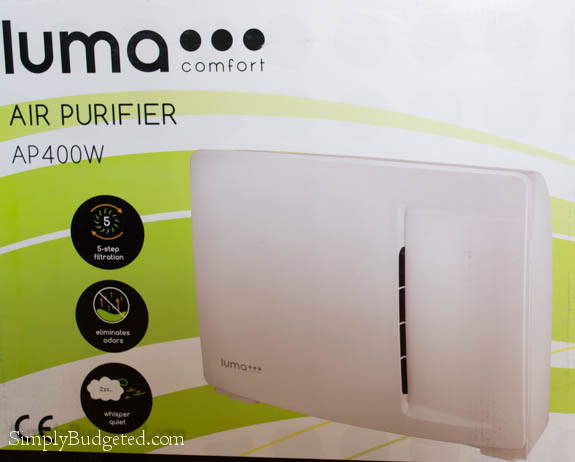 We are excited to provide a product review of the Luma Comfort AP400W Air Purifier . The Luma Comfort AP400W Air Purifier offers high-efficiency air filtration, a comprehensive 5-stage purification system, and intuitive controls – all within a sleekly designed machine! With a coverage area of up to 400 square feet, this Air Purifier is ideal for bedrooms, living rooms, dens, and office spaces. The AP400W is equipped with a carbon pre-filter, HEPA filter, VOC filter, TiO2 filter, and UV light to remove over 99% of indoor pollutants such as dust, pollen, animal dander, odors, mold, bacteria, and viruses. Additional features include a SmartClean indicator that lets you know when each filter needs to be replaced as well as a programmable timer. I have had an air purifier or air cleaner in my/our bedroom for over twelve years. I suffer from year round allergies with one of my key allergies being dust. I am also willing to admit that our animals, two cats and a dog, spend a lot of time in our bedroom. They hide in here when when the kids are being crazy. They sleep in here at night … unless the cats are up fighting in the middle of the night. Did I mention that I am allergic to all of our pets too? Yeah, animal fur/dander is one of other major allergies. When the box came in the mail it had three key features on the top. Brian LOVES the whisper quiet mode. He hated the hum of the old air purifier so he loves that it is quiet. With the pets in our room and three kids around, the odor eliminator is a great help in any space in our house! The 5-step filtration is great for my allergy suffering. As Brian assembled the Luma Comfort AP400W Air Purifier, I was excited to read about what the different filters did. Oh and assembling was just unwrapping the filters and putting them in the correct order. What else? The Luma Comfort AP400W Air Purifier will tell you when you need to replace filters. I have learned over my allergy years that if you aren’t prompted, you will forget about those filters. So it is great to have a reminder to replace them! One less item I need to worry about in our house schedule. We also gained more space back in our bedroom thanks to the Luma Comfort AP400W Air Purifier. The Luma Comfort AP400W Air Purifier is 22.2″ x 9.9″ x 18.6″. It sits closer to my side of the bed but it will work in a room up to 400 square feet! 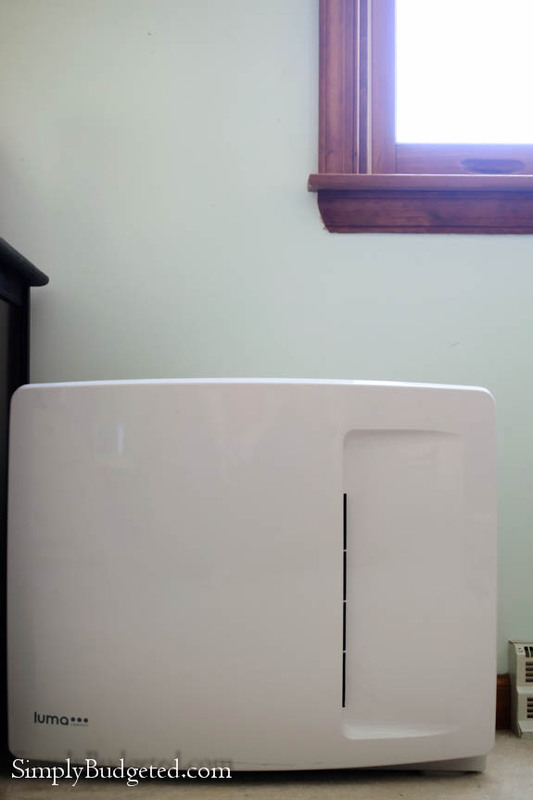 Are you an allergy sufferer that could use an air purifier? We are thrilled that Luma Comfort is offering one of our readers the opportunity to win a Luma Comfort AP400W Air Purifier. Good Luck!!! Sounds like a great upgrade from the air cleaner I have had in my bedroom for the last 10 years! I love the 5 filter stage filtration. Living in a house that has some moisture issues I like that the UV light destroys and inhibits growth of mildew, mold and bacteria. Would be great for my small home as it covers 400 square feet. I like that it removes 99% of particles. I like that it removes dust and pollen because we’re having allergy issues. I like that the Luma Comfort AP400W has a UV light that destroys and inhibits growth of mildew, mold and bacteria. I learned that it removes 99% of particles. I love that it removes pollen. I love that it removes 99% of mold from the air! I like that it is lightweight, portable and can be moved from room to room easily. I like that it removes bacteria and viruses from the air. We are always bouncing our colds back and forth here, this is put an end to that! 99% of particles removed, awesome. Living in an older home, dusting is an endless grind. it destroys the growth of mildew! I love that it covers 400 square feet. I don’t have a very big house so this would be great. I like that it removes pollen. My favorite feature is the carbon pre-filter, HEPA filter, VOC filter, TiO2 filter and UV light to remove over 99% of indoor pollutants such as dust, pollen, animal dander, odors, mold, bacteria and viruses. I love that this eliminates 99% of particles! That it covers up to 400 square feet. We have a small one in my 5 yo’s room, and it is just not enough. This would be great and cover both bedrooms, which would help the hubby who also has allergies. I think its pretty neat that it has a UV light & can get rid of mold, bacteria and viruses. I like that it employs UV light to eliminate pollutants. I love how it removes over 99% of indoor pollutants such as dust, pollen, animal dander, odors, mold, bacteria and viruses. This would be very nice to have in my home. I like the timer option – what a great idea! I like the filter replacement reminder feature. This is supposed to work wonders. I like that it contains a UV light. I like that it eliminates over 99% of particles. I learned that it removes 99 percent of all particles.. I love that it is equipped with a carbon pre-filter, HEPA filter, VOC filter, TiO2 filter and UV light to remove over 99% of indoor pollutants such as dust, pollen, animal dander, odors, mold, bacteria and viruses! I like the indicator that warns you about replacement. I’m terrible at remembering that sort of thing! I like the Modern flat panel design. Makes it easy to put in any room. A lot of other purifiers are just too big and ugly. I like that it purifies 99% of particles and in a 400 ft area! The UV light….Being a germaphob, this is perfect for me!! The SmartClean indicator that lets you know when each filter needs to be replaced. I love that it removes 99% of particles in the air! I love that it covers 400 sq ft and that it removes 99% of particles in the air. I also love the sleek design. I like that it is portable and takes care of 99% of pollutants. I like the UV light – it removes over 99% of indoor pollutants such as dust, pollen, animal dander, odors, mold, bacteria and viruses. I love that it has 5 filters so that it filters out 99% of indoor pollutants such as dust, pollen, animal dander, odors, mold, bacteria and viruses. My favorite feature of the Luma Comfort AP400W Air Purifier is the UV light which destroys and inhibits growth of mildew, mold and bacteria. This would be especially useful in our basement during the rainy season. I like that it removes 99% of pollutants which would be great for my son who has indoor and outdoor and food allergies. I like that it quickly removes airborne pollutants such as dust, pollen, odors, mold and more. removes over 99% of indoor pollutants such as dust, pollen, animal dander, odors, mold, bacteria and viruses. I love the HEPA filter, and that it eliminates 99% of indoor pollutants. I love that it gets rid of 99 percent of things like pet dander, mold, odors, pollen, bacteria and viruses! I want to win this! Gets rid of mold and that’s a problem where I live with the humidity. I live by the beach and the sandy air raises havoc on my lungs. This would be a blessing! i love that it removes 99% of particles. so cool. My favorite feature is the UV light that destroys and inhibits growth of mildew, mold and bacteria. I like the programmable timer. I covers 400 square feet and eliminates 99% of particles. I like that it “Quickly removes airborne pollutants such as dust, pollen, odors, mold and more”. I love that it can tell you when the filter needs to be changed. I appreciate that it has a 5-stage purification system – my current (tabletop) purifier is one of those that utilize a single flimsy filter. I love that it inhibits growth of mildew, mold and bacteria. Love that it can remove viruses. This would be a wonderful win for my family here in Montana, which is as dry as a bone in winter.